October's unusually warm weather this year has extended the paddling season for fair weather kayakers like Dianne and I. In fact, we took a trip this weekend to Broken Bow, Oklahoma to kayak my favorite Oklahoma river…the LMF! The LMF River offers an exciting four mile downriver trip that begins at the re-regulation dam, proceeds through a shallow rock garden, then some narrow rapids and a finally a couple small ledges with the take-out being the Highway 70 Bridge. The fun is highly concentrated on this river. Each bend in the river seems to offer another rocky obstacle or amazingly lovely scene. The water is crystal clear and cold all year long. Best of all, the electrical needs of the community and the water needs of the trout mean this river almost always has excellent water levels for kayaking. Those who know me well, know that I would love to greet the sunrise every weekend on the banks of this fantastic river. This is why we usually spend the night in Broken Bow, even though it is only a couple hours from home. Sadly, this trip did not allow me to greet the dawn on the river bank due to some unpleasantness on the drive from Okmulgee to Broken Bow. Although the bow of my boat has never been broken on this river, the front-end of our pickup truck suffered mightily this time. Dianne and I were driving to our hotel, the Hochatown Country Lodge, when a deer jumped out in front of us on Highway 3 just outside of Rattan, Oklahoma. We were moving at highway speed and simply could not avoid hitting the deer. The damage to the truck included breaking our transmission cooler and leaving us stuck on the side of the road right by the Little River Park. The damage to the deer was even more severe. The really nice folks at Steel's towing carried our wounded Chevy the last 30 miles or so into Broken Bow and even delivered both of us and our kayaks to the Hochatown Country Lodge. In the morning Jesse, our tow truck driver, planned to try to repair the truck enough for us to limp back home to Okmulgee. Like everyone in this friendly little town, Jesse delivered for us above and beyond the call of duty. On any other trip, the events detailed above would have canceled any dream I had of paddling my favorite river...but this trip was different. 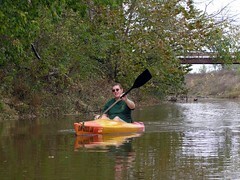 We recently started participating in a new Oklahoma Flatwater Paddlers Yahoo! Group that Al Want launched. In fact, we had arranged to meet them at the hotel on Friday night. Although Dianne and I have met other Oklahoma kayakers through our paddling blog, this was the first time we planned a trip through Al's new group. Al and his wife Donna were on the spot as soon as we reached the hotel. They insisted that canceling our kayaking trip would do nothing to repair our truck. Even though we were unable to do our part in boat shuttling, Al and Donna went FAR out of their way to make sure we could still run the river. They even carried us to Jesse's shop after our adventure to pickup our truck! Everyone knows that paddling with companions is MUCH safer than being on the water alone. Groups, like the Oklahoma Flatwater Paddlers, can help you build the relationships that will make your river adventures much more safe and enjoyable. One thing I learned this weekend is that the risk doesn't begin and end on the water. When taking road trips that are even just a few hours from home, a support network of friends can be the difference between major disasters and minor annoyances. Since Labor Day has passed, many of the Broken Bow area canoe liveries have shut down for the season. 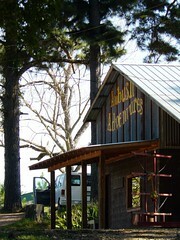 However, Ambush Adventures (see picture) was still open for business. Al and Donna had to make two trips from the lodge to get all five kayaks and all six paddlers to the outfitter. However, once we were all assembled the outfitter wasted no time in busing us to the put-in. Kayaking the LMF in the off-season means less crowding on the river, but fewer hilarious boat mishaps to photograph. The LMF is barely tame enough to be called Flatwater Paddling, in fact Dianne and I break out the spray-skirts for this voyage. Al and Donna had their cockpits covered as well and they also supplied a Sit-On-Top tandem kayak for Heather and Reed to paddle. Everyone in our group made it down the river with dry hair, but several folks in canoes and uncovered kayaks were not so fortunate. As usual, the river level was good enough to avoid the need to portage. We didn't hit the water until nearly noon, so we didn't see a great deal of fish or wildlife. However, even in the 'too-bright' light of the noonday sun, we managed to take some very nice kayak pictures. I think I may switch back to my plastic bladed paddle on my next trip. My new fiberglass bladed Carlisle paddle, though wonderfully light, did NOT sound too good bouncing off the rocks! Lodging at the Hochatown Country Lodge was great. Here’s an example: we told them we had hit a deer and would need an extra late check-in time and to stay an extra night. They set up all that AND gave us a discount on both nights purely out of pity. In a nutshell, the service was as excellent as the location. We got a Jacuzzi room for the first night. The Lodge’s Jacuzzi room was easy to find, clean and well equipped for less than $100. Although we couldn’t find free WiFi at the hotel, there is an Internet cafe just a short walk from the Lodge. Also within easy walking distance of the lodge are: a liquor store, diner, chocolate shop, convenience store, chainsaw sculptor, go-kart racetrack and more. Hochatown, Oklahoma is small, but loaded with fun...just like the Lower Mountain Fork River itself. Dianne and I really enjoyed paddling with Al, Donna, Heather and Reed. Flatwater Kayaking is an excellent group activity. It offers opportunities to just paddle along slowly in groups and talk or to venture off alone to explore for a while. Thanks for the help Al & Company, we owe you guys some major shuttling! I think a few others from the Oklahoma Flatwater Paddlers group are planning to head to Broken Bow this coming weekend. If you have never paddled the LMF, I cannot recommend this river highly enough. Get with the group and go…you have nothing to lose but..uh…your wallet, keys, cell phones, paddles, water bottles, beers, glasses, etc. What an incredible trip report, I'm so glad you both are OK. I know how it must feel as I recently had a highway encounter with a deer. I also benefitted from kind and wonderful people helping me out. It sounds like the rest of the trip was very worthwile. I wish I could have joined you and Alans group. I'm really looking forward to the change of seasons and a chance to get on the water. The entire area just sounds like a kayakers paradise and I love the backwoods flavor too, but I want to take this opportunity to emphasize safety. Kayaking is an inherently dangerous sport, participants need to be aware of their skill level, their equipment and be able to assess the water they will be paddling on. There is no substitute for experience and preparation and caution. I hope everyone will carry and USE the safety equipment common to our sport and most important paddle with others who you can learn from and fellowship with on the water. I have found kayakers to be the most awesome group of people to spend time with. Thank you for the tip regarding the Paddling Group at Yahoo. Have never made it to Oklahoma to kayak, but will definitely try for it in the future. Couldn't use the link to the hotel, though as it wasn't working. Thanks for the tip on the bad link, I will correct it immediately.